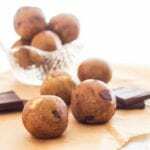 With a mixture of healthy fats from walnuts and hemp seeds, these Walnut Dark Chocolate Chunk Protein Bites will keep you satiated for hours, plus satisfy any sweet tooth or chocolate craving. You might want to make a double batch! In the food processor, whirl the oats, chia and hemp seeds, and half of the walnuts (1/4 cup) into a flour. Transfer to a large mixing bowl and stir in the protein powder. Pour the chopped dates and their warm soaking water to the processor and pulse/process until broken down as much as possible. Add all remaining ingredients except the remaining walnuts and chopped dark chocolate pieces to the processor. Continue blending until smooth and evenly incorporated. Depending on the size of your food processor, either add the flour mixture gradually to the bowl and blend it into the wet ingredients, or add the wet ingredients into the mixing bowl and stir them into the flour. Either way, you’re looking for a dough-like consistency. Stir the remaining walnut pieces and chocolate chunks in last. Dividing the chilled dough into 10-12 even pieces, form small balls with your hands. *The chilling time isn’t absolutely mandatory, but I find that the dough is easier to work with when cold.